When you read the title of this post I bet the first thing that comes to your mind is Bon Jovi’s hit song, ‘Living on a Prayer.’ It’s a song about struggle trying to make ends meet, the people in the song have to keep going and hold on to what they got. They are walking a fine line between making it or not and they are living moment by moment–living on a prayer. One animal sticks out in my mind who lives their life living literally on the edge of life or death is the bullhorn sheep. Their home is on the cliffs of mountains. These sheep spend most of their lives jumping from one cliff to another, finding comfort in living on the edge of these cliffs. I’ve always wondered why do these animals choose to live so close to the edge of death every day? Why don’t they find comfort in grazing grass from a nice flat green pasture? The answer lies in how the food chain operates—fear of the predators outweighs their fear of the cliffs. Predators cannot get them when they live on the cliffs. I couldn’t even imagine living the way the bullhorn sheep live every day. Hanging so close to the edge living moment to moment not knowing if they would slip—finding comfort on the edge of death. They become accustomed to living like this, getting used to slippery slopes, falling rocks and become agile to steep cliffs. Imagine if we lived life like that? Every moment of every day was dependant upon our prayers? Or each moment was dependant on God for every breath, every step, every need of our day? I am guilty of not always turning to God before making decisions or reacting to certain situations. What if instead of responding and making choices on my own, I instead turned to God first in prayer? One verse that sticks out in my mind that helps lead us to depend on God for every need is 2 Corinthians 10:5. There is always going to be something in this world trying to distract us and lead us away from what God desires for us. The world is going to tell us that we need more love, more money, more power. These things will never lead us to the abundant life God desires for us–only more tired and more empty because there will always be ‘more’ to chase– there will never be an end to more. We demolish arguments and every pretension that sets itself up against the knowledge of God when we allow God to take captive our every thought and make them obedient to Him. We belong to Christ. When the shouts of the world drown out the voice of God we can become deaf to His voice. In the busyness and chaos of this world, we need to find the time to slow down, be still, sit in the presence of God so we can hear his voice. God did not design us to keep going to the next best thing. He designed us to depend on Him like our lives depend upon it. I encourage you to write 2 Corinthians 10:5 down on a notecard, put it on your mirror and pray this verse every day for the next week, as a reminder to allow God to take every thought captive and make them obedient to Him. This verse trains our minds to direct our hearts to where He desires us to go. I promise you His desires and plans will lead to the best life ever. Just like the bullhorn sheep, predators cannot get us when we live under the umbrella of God’s protection. The enemy will masquerade himself as an angel of light (2 Cor. 11:14). He will try to lure us into areas where we are exposed and not protected. Satan is always prowling around like a lion ready to devour us at any moment of any day. Molding a life of prayer like our lives depended on it is the very thing that will protect us, bring our battles into the light and hear God’s voice. The next time you have a temptation, an impure thought, discouragement or doubts……. Ask God to take captive every thought and make them obedient to Him. Imagine what our lives would look like if we lived our lives living on a prayer? Prayer: Lord Jesus, we pray we will focus our hearts and minds on you. We pray you will take captive our every thought and make them obedient to you. We pray we will stay alert of the schemes of the enemy and stay under the umbrella of your protection. Help us mold a life of prayer that is dependant upon you for every moment of every day so we can live our lives living on a prayer. Help us stay in prayer so we can hear your voice and have our steps directed. We love you, Lord, in Jesus name. Amen. How important is prayer in your life? Do you live life living on a prayer? 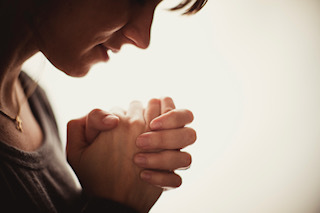 What is one action step you can do today to make prayer an important part of your daily life?